On Thursday night I was waiting to get into the Irish Pavilion at Folklorama when I heard a train horn. The CP Emerson subdivision went right by where I was waiting, so I ran over to the fence and waited for the train to come. Oddly, it was CN 2201 running light, backwards. I took a couple of stills. I was really expecting a CP train! I thought it was odd that a CN unit would be running over the CP Emerson subdivision. Looking at the map, I'm guessing the engine came from a train in Fort Rouge and ran over the CN St. Boniface lead / Terminals Cutoff onto the CP La Riviere sub for a short time before cutting over to Symington yard. 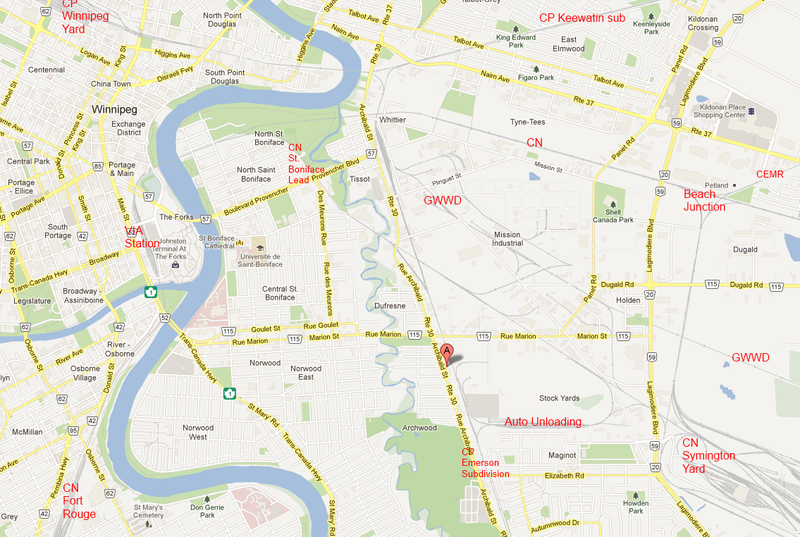 I labeled this little map from Google Maps to show some of the locations in Winnipeg. In the bottom left is the CN Fort Rouge yard, and if you follow the CN Rivers sub up from there, it goes to the VIA station in downtown Winnipeg where the line becomes the CN Redditt subdivision, curving east to cross the Red River and going across the map to Beach Junction. At Beach Junction you have the north entrance to Symington Yard, CEMR's connection to their yard, and the continuation of the CN Reddit subdivision. The CP Keewatin subdivision runs across the top of the map, and the beginning of CP's downtown Winnipeg yard is just visible in the top left. Note the GWWD yard smack in the middle, with their line heading southeast off the map. 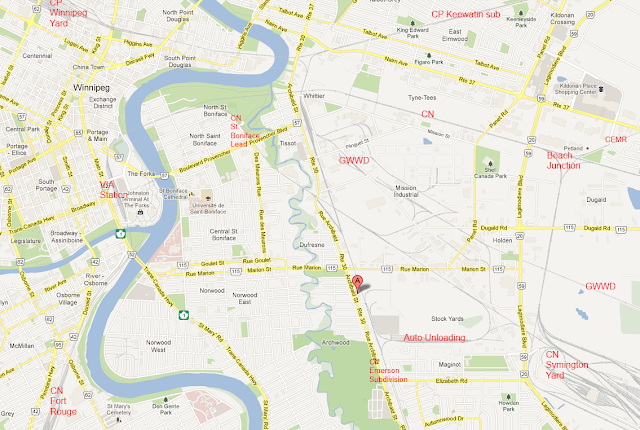 You can see what a tangle of trackage is around the old stockyards area of Winnipeg. I suspect a few of those tracks do not actually exist, but most do. Someday I'll have to go do a survey to find out who owns each of the tracks.